So on Friday night, I attended the Puma event party at Capsquare. Thanks to Bangsar Babe for the VIP entrance tickets, and to mate,Wei Meng for graciously picking me up on the way. He had to get off work early to come pick me up. Thanks!! Red VIP and Blue Guest hand wrist bands.. 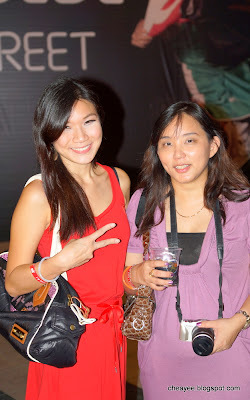 So I managed to take a picture with Bangsar Babe (Sue Lyn)- won my Puma tickets from her! Wei Meng, who so graciously got off work early and picked me up for Puma event. Busy at the shoe design area..